A group size of three to eight people. If you would like to have a more personalized experience below the recommended group size, we would be happy to facilitate this for you. Once we arrive in Nairobi we’ll make our way to the Maasai camp situated north of the city. This transfer allows you to sit back and relax whilst absorbing the beautiful scenery that Kenya has to offer. We’ll pass through small villages; endless barren landscapes and we may get the chance to observe some native wildlife in its natural habitat. We’ll also be able to view the towering slopes of Mount Kenya that stand tall above the surrounding landscape. The Maasai name for Mount Kenya is ‘Ol Donyo Keri’ meaning ‘The Mountain of Stripes’. This name depicts the contrast between the white glaciers and dark valleys. The Maasai believe that their ancestors came down from the mountain at the beginning of time. 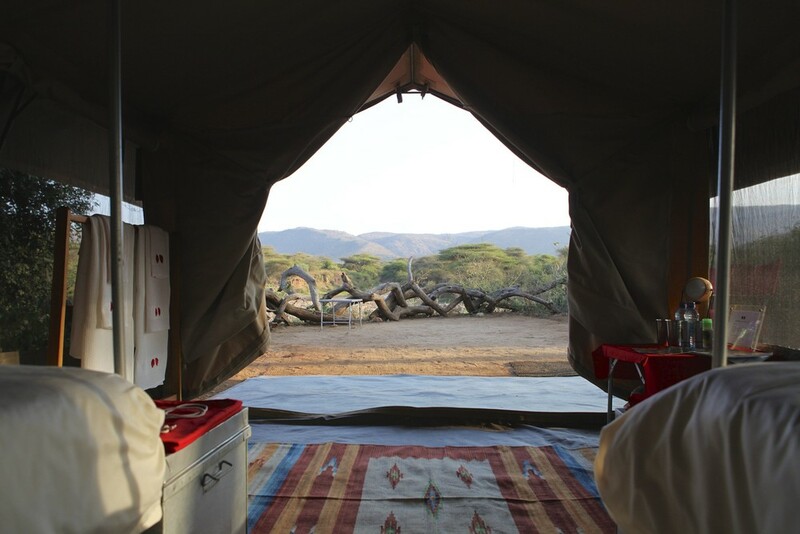 Once we arrive at the Maasai camp, we’ll settle into our exclusive bespoke camping and receive a brief by the Expedition Leader regarding the week ahead. After breakfast, we’ll meet the Maasai warriors. The Maasai warrior culture is one of the world’s last great warrior cultures and is a great source of pride for the Maasai people. The role of a Maasai warrior is to build ‘kraals’ (Maasai homes), to protect their cattle from predators and to provide security to their families. You’ll be amazed by the Maasai people’s distinctive culture and dress style. They’ll welcome us by offering us to dress in their clothing and we’ll learn about the practical elements of each item of clothing. The Maasai people strategically select their territory along the game parks of Kenya. When they arrive in a new area they explore it in a certain way, looking for specific traits. After we have lunch, the Maasai warriors will help us explore their current territory in the way they did when they first arrived. Later on we’ll arrive back at camp to watch the sun set over the African plains followed by dinner around a fire. Today will be dedicated to learning about the Maasai warriors fighting techniques, which are vital in protecting their livestock and families. The Maasai weapons such as arrows, bows, spears and ‘rungu’ (club weapon) are carved from local hardwoods by the tribe’s craftsmen. The Maasai warriors will give us hints and tips on how to use each of these weapons and hear stories of when these weapons have reined supreme. We’ll also be invited to practice with the weapons by using marked targets such as trees and rocks. Could you be a natural Maasai warrior? These activities are of course optional and carried out with constant vigilance to ensure yours and others safety. Tracking animals is a key skill essential for survival in the Maasai tribe. While some tracking skills can be honed and developed over time, some individuals have a natural ability to read the environment and spot vital signs. This natural ability can define an individuals standing in the Maasai community. Today we’ll learn these skills from some of the most skilled Maasai warriors in animal tracking. By reading signs in the environment we’ll be taught how to tell a species of an animal, the direction and speed of the travelling animal and how long ago it passed through the area. These skills are not only key in finding food for the tribe, but can also be useful in tracking lost livestock or identifying nearby predators. If conditions allow us to, we can also learn how to approach wild animals without being noticed. Like every community world wide, the Maasai have to deal with common illnesses and diseases that arise in their people and livestock. Today we’ll learn about how plants are used in traditional medicine to deal with these ailments. Due to the numerous beneficial properties of plants, such as nutritional and medicinal value, they are extremely valued and treasured in the Maasai world. Generally older Maasai warriors are very experienced in extracting specific elements of plants for the treatment of certain diseases. In some plants active ingredients are concentrated only in the core of the wood, while in others they are located in the seeds, leaves, stems, flowers or in the roots of the plant. We’ll discover which plants are used to treat the most common illnesses, how to find them and how to extract these important components. In the dry season, Maasai warriors have to relocate with their cattle to greener pastures to ensure their survival. This means they have to live in the bush far away from home for 3-4 months at a time. With this, the Maasai warriors have learnt specific skills from their ancestors that allow them to survive in this strenuous landscape. Today, we’ll learn these survival skills, such as how to find water and the best way to start a fire. We’ll also discover how the warriors protect themselves and their cattle from the abundance of predators out in the bush. After breakfast, we’ll make our way to the living homestead of the Maasai neighbourhood and learn more about the remarkable self-sufficient Maasai way of living. We’ll be introduced to various members of the tribe, each of which has a vital role in their community to ensure their survival. We’ll also meet the tribe elders, who will educate us on their beliefs, their culture and stories of their past. After lunch we will be given the chance to put all the skills we have learnt over the past few days into practice. At the end of this remarkable day we’ll share local foods with the Maasai warriors and tell stories around the fire under the Kenyan night sky. This will give you a real feel of life as a Maasai warrior. This adventure will depart with a minimum of 3 people and a maximum of 8*. From £7,775 per person based on two people sharing (£880 single supplement), this includes international flights with British Airways from London Heathrow (flights from alternative airports worldwide possible), an Expedition Leader from ‘The Adventure Boutique’, accommodation, local staff, scheduled meals, tips for the local staff, local chefs and local transportation. A non-refundable deposit of £1500 pp will be required. A quality local chef and kitchen team will accompany the group when camping throughout the trip; you will not fail to be anything but amazed by their creativity even in the middle of rural Kenya. You will be provided with proper balanced meals to enjoy, that will be nutritious yet tasty. These meals will be tailored to your dietary needs. You should not need any special type of travel insurance for this trip. Do ensure that your insurance covers the African region. If you do not have adequate insurance cover, The Adventure Boutique team can refer you to appropriate insurers. This is dependent on your nationality, our team can advise you on this before signing up. British citizens can obtain one, in advance, from the Kenya High Commission, or at the airport on arrival. Health facilities, hygiene and disease risks vary worldwide. You should take health advice about your specific needs as early as possible. Sources of information include: www.fco.gov.uk, www.hpa.org.uk, www.nathnac.org, your General Practitioner or a specialist clinic. Clients travelling to worldwide destinations are recommended to seek advice from the sources mentioned above and, where recommended, obtain vaccinations or tablets for protection against, for example, Malaria, Hepatitis A, Polio and Typhoid. Please note that any passenger travelling between South Africa and either Zambia, Tanzania or Kenya (in either direction) will be required to have a Yellow Fever Vaccination Certificate with them. The vaccination needs to have been given no less than ten days prior to travelling. The group size should be a maximum of eight people. The number of participants is kept to a level where quality can be maintained. We normally have a maximum number so as not to allow the groups to become too large. We strongly believe that by doing this, the Expedition Leaders will be able to look after you more carefully, in turn you will find the group dynamics work much better and your success rate and enjoyment level increases immeasurably. If you are a group of friends of more than eight, then obviously we will work together to accommodate you. If you would like to have a more personalised trip below the recommended group size, we would happy to facilitate this for you too. What is the minimum age a person has to be to go on this trip? You'll find limited phone reception during your trip. We specially carry a satellite phone in case of emergencies, but we also realise people may need to keep in touch with their loved ones or have some work commitments to deal with. The satellite phone can be used for a charge.